Let’s get on the same page about where potatoes fit into your whole-food, plant-based, nutritarian lifestyle. We’re talking about ALL. THE. POTATOES. 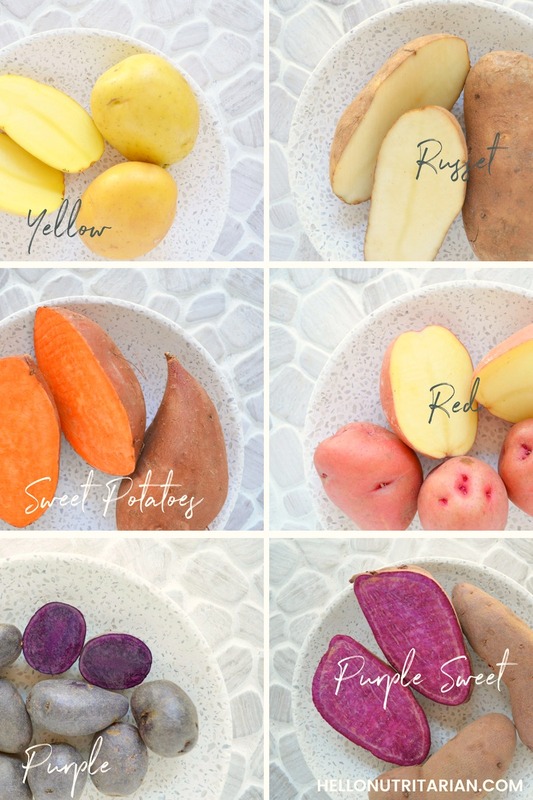 White, yellow, red, sweet, purple-sweet, purple-fingerlings–seriously, who knew there were so many kinds of potatoes to know about? We’re covering it all because, I don’t know about you, but I think potatoes are glorious and want to enjoy them in my nutritarian lifestyle. 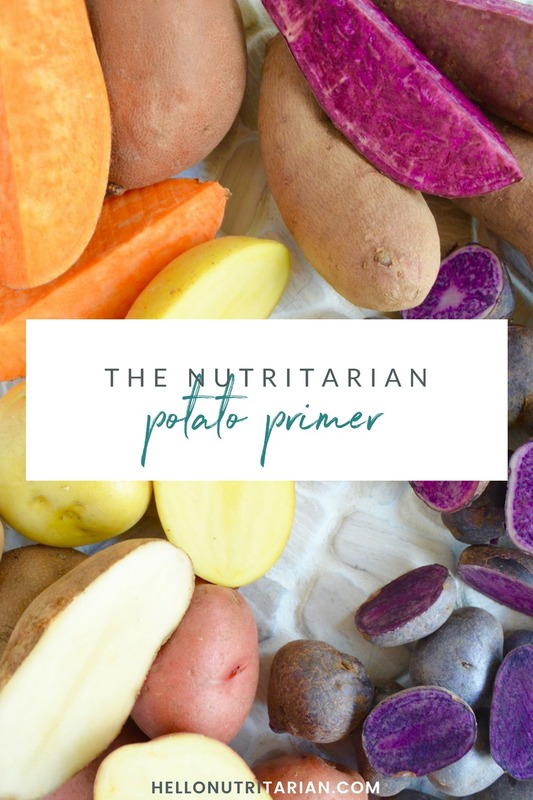 But I also understand that the goal of eating nutritarian is to maximize the amount of nutrients you consume, and potatoes don’t fare so well in that area compared to other whole plant foods. So, where is that fine middle ground between I-want-a-potato-at-every-meal and this is the amount of potato you can eat and still be loosing weight and/or achieving health excellence? Let’s figure out what the science says so we can eat potatoes in the most favorable, health-promoting way possible! Can you eat potatoes on the nutritarian diet? How much potato should you be eating? What are the best types of potatoes to eat? How should you eat potatoes? And we’re compiling all of Dr. Fuhrman’s potato-eating advice from his books: Eat to Live (2003), Super Immunity (2011), The End of Diabetes (2013), The End of Dieting (2014), and The End of Heart Disease (2016)–with a bit of extra guidance from Dr. Greger’s opus How Not to Die (2015). All of this information is laid out for you here to truly understand where potatoes fall in the eating-for-health continuum. So, are you ready to dig in? This is the advice that I’ve always followed that conforms to Dr. Fuhrman’s aggressive weight loss plan. And I’ll be the first to admit that there are weeks where I choose to exclusively eat potatoes as my 1 cup “cooked starchy vegetable/whole grain” allotment for the day, #sorrynotsorry. Dr. Fuhrman definitely restricts this food category more than most other plant-based doctors, most famously Dr. Esselstyn and Dr. McDougall, because he considers starchy vegetables and whole grains to be “the culprit for those who have difficulty losing weight” (Eat to Live, p. 216). Dr. Fuhrman also considers starchy vegetables like potatoes and whole grains to be less-than-ideal high-carbohydrate choices and considers beans, corn, wild rice, barley, steel-cut oats, oatmeal, squashes, berries, and fresh fruits to be the more favorable selections (Super Immunity, p. 113). Are You a Candidate for Frequent Potato Consumption? So, there’s a pretty big caveat to eating potatoes as part of your “cooked starchy vegetable/whole grain” allotment on a regular basis. Potatoes (both white and sweet) effect people differently. That’s to say that eating potatoes can be benign for one person’s health while being harmful or counter-productive to another person’s health. 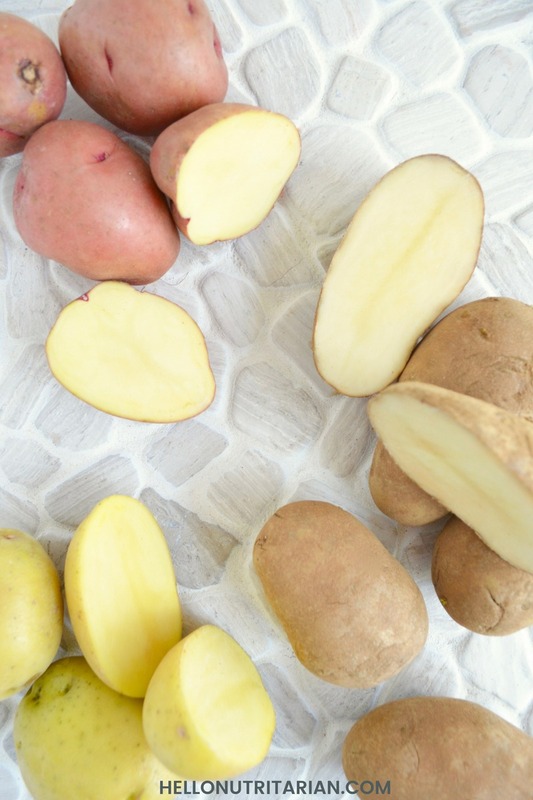 If you fall into either of these groups, potatoes are likely not the ideal high-carbohydrate choice for you while following a nutritarian diet. Unfortunately, “because of the fat-promoting effects of insulin, high-gycemic foods can make it more difficult for an overweight person to lose weight” (The End of Heart Disease, p.35). “[I]f you’re significantly overweight or diabetic [Dr. Fuhrman] recommend[s] limiting brown rice, millet and even sweet potatoes, as high glycemic load foods are generally considered 20 and above” (The End of Dieting, p.133). And you need to tighten the bolts even more if you’re diabetic by “avoid[ing] regular and liberal consumption of foods with a GL above 15, at least until [your] diabetes is in better control and [your] weight as dropped significantly” (The End of Diabetes, p.104). But, even if you fall into one of these categories, that doesn’t mean you can never eat potatoes again! It just means that you should “limit” these higher-glycemic-load foods to an occasional option and choose more beneficial high-carbohydrate choices (like beans and whole, unprocessed grains) more frequently. Remember that’s only going to be until you resolve your weight and diabetes with a period of prolonged nutritarian living. How Much Potato Should You Be Eating on the Nutritarian Plan (and Still Lose Weight)? As we’ve discussed before, there are a spectrum of different plans under the nutritarian umbrella. 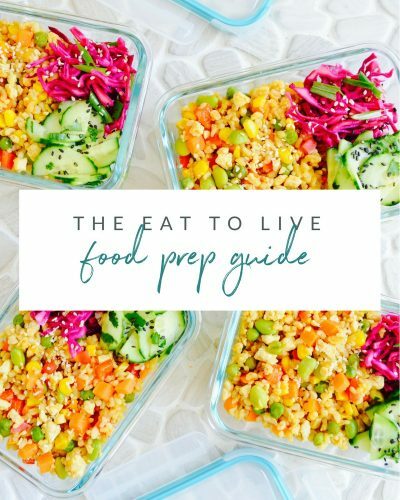 Let’s assume that if you’re reading this article right now, you’re more than a nutritarian novice (who would likely be following the more liberal Basic Guidelines approach). So, let’s focus on the Aggressive Weight-Loss Plan where the goal is losing weight. This plan allows you to eat up to 1 cup of “cooked starchy vegetable/whole grains” daily. We learned earlier that white and sweet potatoes are considered part of that limited food group, so you could technically have a max of 1 cup of potatoes daily (with no other options from that food group or the day). Yes, you can eat potatoes daily and still lose weight! Go ahead and do it: happy dance, cabbage-patch, get to dabbing–cause that’s certainly cause for celebration in my book! The reason you can make it happen is because the amount of potato your eating is restricted to only one cup. And (hello!) you’re going to be positively stuffing yourself with 1 pound raw and 1 pound cooked veggies daily. So it shouldn’t come as a surprise that you will continue to lose weight! But remember those two big caveats from earlier? If you’re considerably overweight or diabetic, you don’t want to be eating potatoes daily. You want to “limit” them. Now, Dr. Fuhrman doesn’t come right out with a number as to what “limiting” means in any of his books, but I would take it to mean no more than once or twice weekly. Can You Eat More Than 1 Cup of Cooked Starchy Vegetable / Whole Grains? This is kinda critical to explore, don’t you think? I don’t know about you, but the opportunity to eat more potatoes and still reach my health goals is an opportunity I’m not willing to pass up! When I went to Dr. Fuhrman’s Culinary Getaway last May, the topic of eating more than the recommended 1 cup of “cooked starchy vegetables/whole grains” definitely came up at our Q&A sessions. Dr. Fuhrman conceded that you technically can eat more high-carbohydrates from the “cooked starchy vegetable or whole grain” category if you’re physically active and you continue to lose weight following the nutritarian plan. Each person has to find the level that works for them (we aren’t just carbon copies of one another). And, again, this is for people who don’t fall into either of those two problematic groups. 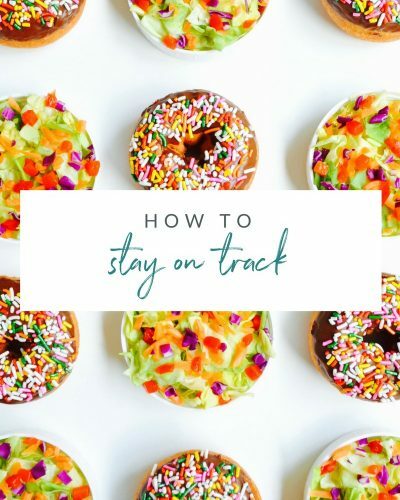 The only way you can gauge how much you can eat in this category, taking into account your specific activity levels and body type, is to test it out and see what happens. 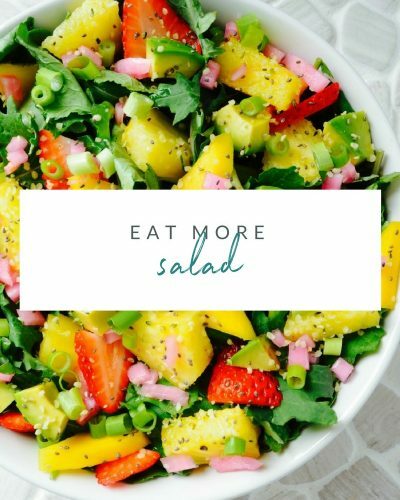 If you have 2 to 3 weeks of consistently not losing weight (when you have weight to lose) then you need to adjust your portions in the limited foods category (which includes: starchy veggies / whole grains, avocado and nuts & seeds). Cause if you know anything about me, you know that I’m seriously turned-on by brightly-colored produce, and my eyes have been opened my friends to the wonderful world of pigmented potatoes! 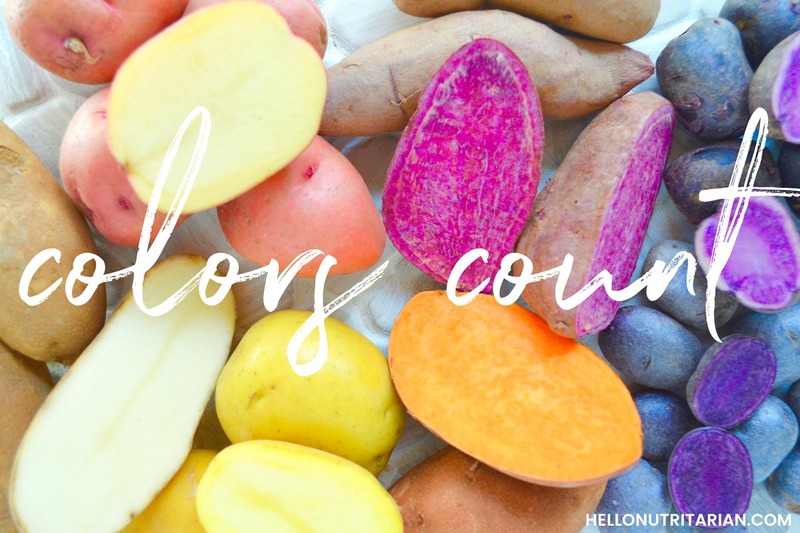 There’s a whole amazing world out there of heirloom potato varieties in jaw-dropping shapes and colors (just take a look at what you can find in a farmer’s market in New York)! I started paying attention to potatoes when I discovered tiny purple fingerling potatoes at my local Sprouts and Whole Foods supermarkets. 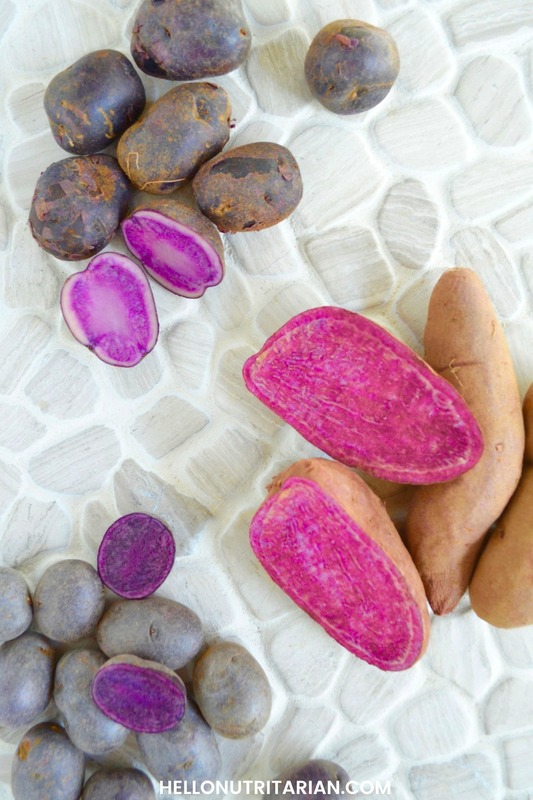 Then I did some research and discovered just how amazingly nutrient-packed these mega-hued tubers can be (and we’re going to learn all about that very soon)! So, what gives with all these fancy-colored potatoes? The bottom line is pigments = more antioxidants and phytochemicals. And we want as many of those in our bodies as possible because they protect us from disease, fight cancer, ward of dementia and slow the aging process! But I promise you, you don’t need to scour the farmer’s market or the fancier grocery stores to track down blue and purple potatoes! Dr. Fuhrman only deals with two kinds of potatoes in his materials: white and sweet. And by “sweet potatoes” he is referring to garnet yams (the terms are interchangeable here in the US). He doesn’t make the extra distinctions between different colored sweet potatoes and he doesn’t talk about higher-nutrient non-sweet potato varieties. We’re left with his positions on white and sweet, and he favors sweet by a landslide. And he’s in good company too, Dr. Greger has nothing but rave reviews, hailing them as superfoods, and ranking them as one of the healthiest foods on the plant: “[Sweet potatoes] are among the healthiest and cheapest [foods], with one of the highest nutrient-rich food scores per dollar” (How Not to Die, p.327). Dr. Fuhrman gives higher marks to sweet potatoes on his ANDI scoring scale (a way to compare the nutrient-density of different foods based on different health-promoting factors) and ranks white potatoes (with the same score as avocado) just a smidgen higher than cashews, oatmeal and chicken (The End of Dieting, p. 126-7). It seems that Dr. Fuhrman has warmed up a bit to white potatoes in the past few years, even releasing a position paper on white potatoes where he concedes that when they’re cooked and topped “in appropriate manner” they are far superior to processed foods and can be a helpful tool to transitioning into a healthy lifestyle. I get it! Very few people have heard about, let alone seen, a purple potato while on their weekly grocery shopping trip. They are a decidedly recent trend here in the US and a very welcome and happy development when you’re a bonafide-potato-lover like me! 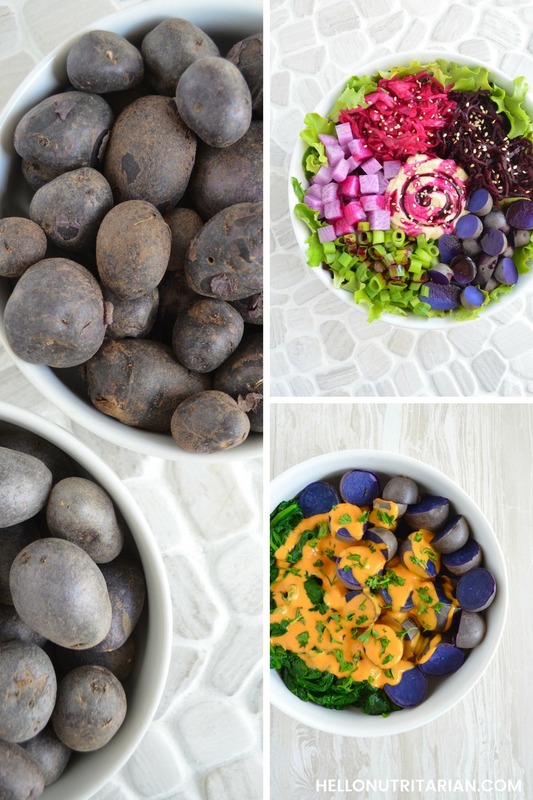 While Dr. Greger agrees with Dr. Fuhrman that “sweet potatoes are healthier than plain potatoes” he points out that “if you’re going to choose the latter, seek out those with blue or purple flesh” (How Not to Die, p. 328). Honestly, it’s music to my savory-flavor-loving ears because after spending the first 4 years of my nutritarian journey exclusively eating sweet potatoes I was in desperate need of a change! Dr. Greger reviews and analyzes a study where people ate one boiled purple potato a day for six weeks and they “significantly decrease[d] [their] inflammation, something neither white nor yellow potatoes were able to accomplish” (How Not to Die, p. 328 & this NutritionFacts.org video). Dr. Greger goes on to say that “purple sweet potatoes may offer the best of both worlds” (How Not to Die, p.328). 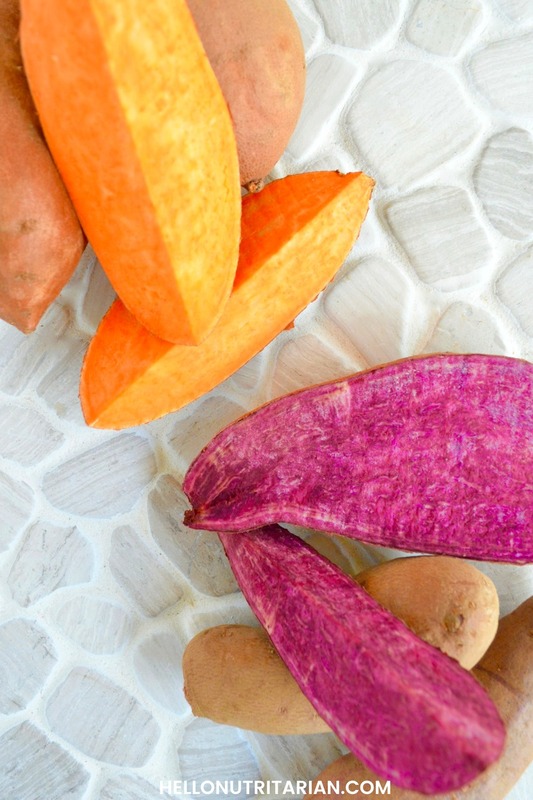 It makes sense that they essentially marry the increased antioxidant power and lower glycemic load of sweet potatoes with the special benefits of purple-fleshed potatoes we outlined above! Potatoes have a higher glycemic index and glycemic load than other vegetables, that fact is undeniable. Dr. Fuhrman makes an important distinction: “Instead of focusing narrowly on the concept of glycemic index, we have to consider the other values of the food as well as the the healthful qualities and the glycemic load of the entire meal when put together. By the way, weight loss and micronutrient adequacy are more important than minor and temporary fluctuations in blood sugar” (The End of Diabetes, p. 50). In other words, “[i]t is not the inclusion or exclusion of a whole plant food like a potato that will make a diet good or bad” (The End of Heart Disease, p. 35). So, what’s the best way to enjoy your potatoes? The absolute best way to eat any potato is with beans in the same meal since beans “reduce the glycemic effect of other foods, even those eaten at separate meals.” (The End of Heart Disease, p.37). Luckily for us nutritarians, we eat at least 1 cup of beans daily. That means that potatoes (of any variety) will never unleash their full glycemic potential in our systems because we have built-in, bean-eating protection! 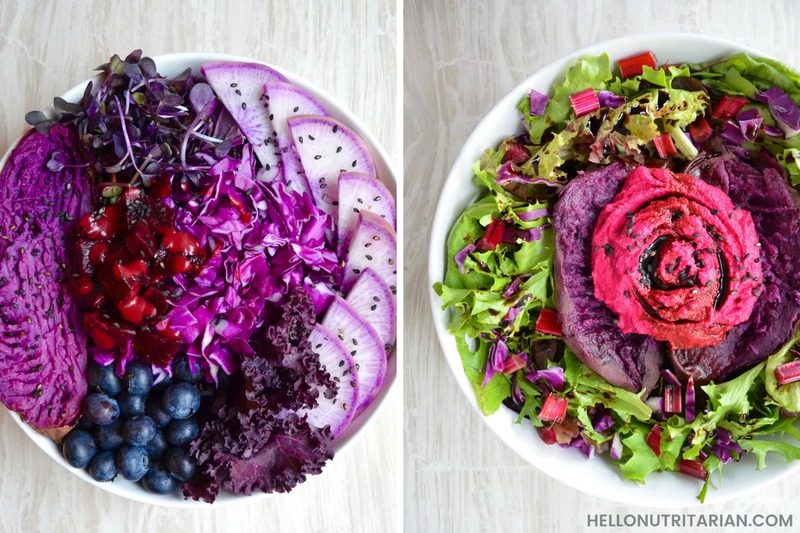 As you can see from the two salads above, my favorite way to eat purple sweet potatoes is as part of my two giant salads for the day. I find that they go particularly well with this No-Oil Beet Hummus Recipe and a drizzle of good-quality balsamic vinegar! Dr. Fuhrman recommends eating your white potatoes with greens, beans, nuts and seeds (The End of Heart Disease, p.35). You also want to be mindful and purchase organic white, yellow or red potatoes as they are one of the top 12 foods with the most pesticides in the US. If you want to be a white-potato-eating rock star then boiling or microwaving a small yellow potato and using it to top a kale salad (as you can see above, right) and adding beans, sprouts and a healthful no-oil dressing is going to give you an A++ in nutritarian compliance. But we all know that there are times where you just want a nutrify-ed taste of comfort or a more share-able recipe when the holidays strike. 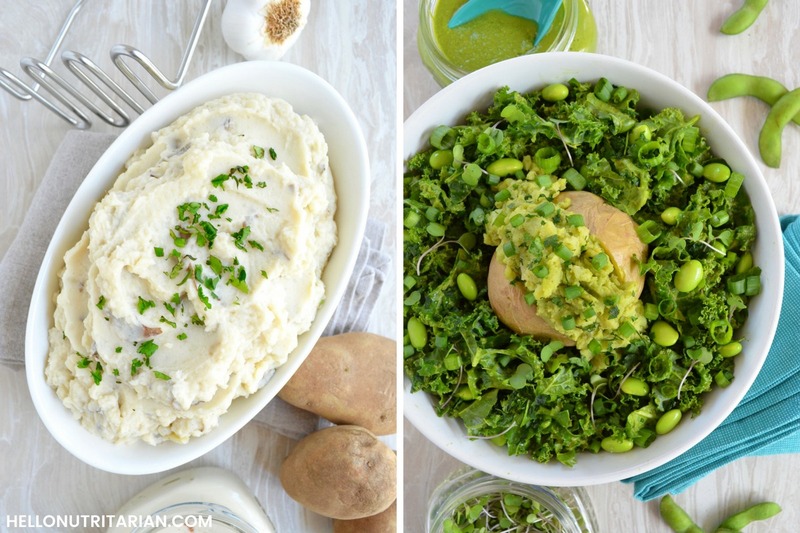 For such occasions, you’ll be glad you have this Nutritarian Mashed Potato Recipe on deck (it’s one of the most highly -reviewed recipes on the site)! The best way to cook a sweet potato, to retain and preserve their nutritional content, is to boil them (How Not to Die, p.327). But regardless if you decide to microwave, bake or broil them, it’s best to keep the skin on since “[t]he peel of the sweet potato has nearly ten times the antioxidant power as the inner flesh, giving them an antioxidant capacity approaching that of blueberries” (How Not to Die, p.327). Sweet potatoes are one of the foods with the least pesticides, so you can purchase these conventionally grown rather than organic. 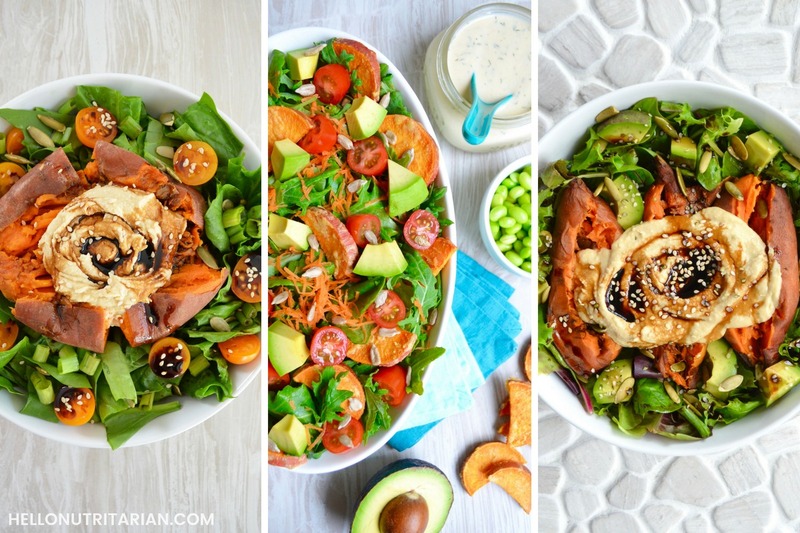 As you can see above, my favorite way to eat sweet potatoes is baked or microwaved, on top of my salads (often with avocado), with a generous serving of this Extra-Creamy No-Oil Humus Recipe or a hummus-based dressing. As I mentioned before, these little blue-beauties have been my recent potato of choice! 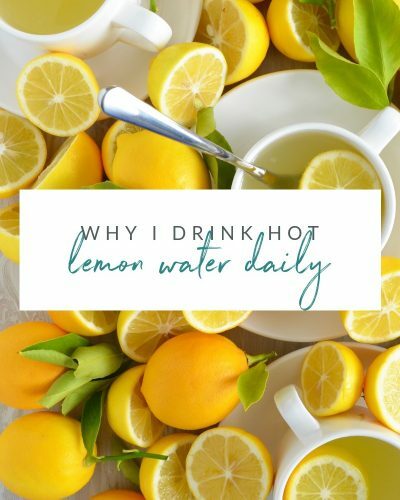 My favorite way to enjoy them is boiled–they keep fabulously in a glass container for up to 12 days after boiling. I add them to my salads cold or warm them up and eat them with cooked spinach or kale and my favorite Nutritarian Cashew Cheese Sauce Recipe! You are now most-thoroughly schooled in all things potato my friend! It feels good doesn’t it? Knowing exactly how to enjoy potatoes responsibly in your whole-food, plant-based, nutritarian lifestyle! Honestly, after just finishing my dinner of two small white potatoes, reading this was just what I needed. Thank you so much for all the work that went into compiling all this info! Sometimes it’s easy to get bogged down by all the seemingly contradictory advice by these great doctors, so it’s nice to realign myself with what I need to be at my best health level. I’ll be saving this article to read and reread. Thank you!!! So wonderful to hear that you found this article helpful, Kayla! Hope you enjoyed those potatoes! This is great! Now I have some serious sources to back up my discussions with my husband about why potatoes aren’t the villains that they’ve been made out to be. I don’t eat them often, but sometimes they just really hit the spot. WOW!! Those nutritarian chili cheese fries sound simply amazing! Thank you so much for sharing that idea with us! And I’m so glad that you found the Potato Primer helpful with hubby! Thanks so much for taking the time to leave a lovely comment! I discovered this UK research and think it’s worth a look. Cooking, cooling, and reheating potatoes ( and rice and pasta) lowers the GI fairly significantly. Although it’s not a license to overeat these foods, it adds some flexibility for those of us who love potatoes, especially. I just found your blog and appreciate it – have most of Fuhrman’s books and (mostly) following a nutritarian diet for 6+ years. What an interesting experiment! I hope they’ll do a longer-term study on it! Thanks so much for sharing with us! Hi Kristen … sorry to say I have been trying to sign in with you for the 7 day cleanse E-Book … but the email I have been looking for in my email is not there to return to you. If you’re using outlook be sure to check your “other” folder in your inbox as they can get automatically filtered out there. You have to “confirm” your email subscription first and once you’ve confirmed, you’re sent a Welcome email with a link to download the cleanse! Loved reading about potatoes — of all varieties! I have been avoiding them entirely and now feel capable of adding them back into my diet in moderation. Thanks so much. YAY!! I’m so happy to hear that you found this post helpful and that you’re ready to incorporate them into your healthy lifestyle!